Achalasia is a disorder of the gullet where it losses its ability to move food along and the valve at the end of your gullet (oesophageal) fails to open to allow food to pass into your stomach. It is a failure of smooth muscle fibers to relax, which can cause a sphincter to remain closed and fail to open when needed. As a result, food gets stuck in the gullet and is often brought back up. 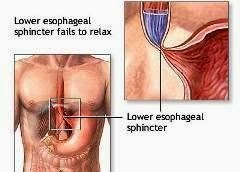 A ring of muscle called the cardiac (or lower oesophageal) sphincter keeps the opening from the gullet to the stomach shut tight to prevent acid reflux (acidic stomach content moving back up into the gullet). Normally, this muscle relaxes when you swallow to allow the food to pass into your stomach. In achalasia, this muscle does not relax properly and the end of your gullet becomes blocked with food. Achalasia is an uncommon condition that affects about 6,000 people in Britain. It is sometimes known as cardiospasm. Symptoms of achalasia may start at any time of life and usually come on gradually. Most people with achalasia have dysphagia, a condition where they find it difficult and sometimes painful to swallow food. This tends to get worse over a couple of years. It may cause you to bring back up undigested food shortly after meals and some of the vomited food may have been held up in your gullet for some time. Bringing up undigested food can lead to choking and coughing fits, chest pain and heartburn. Occasionally, vomit may dribble out of your mouth and stain the pillow during the night. If it trickles down your windpipe, it can cause repeated chest infections and even pneumonia. You may experience gradual but significant weight loss. However, in some people achalasia causes no symptoms and is only discovered when a chest X-ray or other investigation is performed for another reason. What Is The Cause Of Achalasia? Achalasia is caused by damage to and loss of the nerves in the gullet wall. The reason for this is unknown, although it could be due to a viral infection earlier in life. There is no evidence to suggest that achalasia is an inherited illness. Women with achalasia can have a normal pregnancy and there's no reason why their children will not develop normally. If your GP thinks you have achalasia, you will be referred to hospital to have some diagnostic tests performed. A barium swallow involves drinking a white liquid containing the chemical barium, which allows the gullet to be seen and videoed on an X-ray. In achalasia, the exit at the lower end of your gullet never opens properly, which causes a delay in barium passing into your stomach. An ordinary chest X-ray may show a wide gullet. A flexible instrument called an endoscope is passed down your throat to allow the doctor to look directly at the lining of your gullet and stomach. Trapped food will be visible. The endoscope can be passed through the tight valve at the bottom of your gullet and into your stomach to check that there is no other disorder of the stomach. Manometry measures pressure waves in your gullet. A small plastic tube is passed into your gullet through your mouth or nose and the pressure at different points in your gullet is measured. In achalasia, there are usually weak or absent contractions of the gullet and sustained high pressure in the valve at the lower end of the gullet. It is this high pressure and the failure of the valve to relax in response to a swallow that causes difficulty in swallowing food and food remaining in the gullet. The aim of treatment is to disable the valve so that food can pass into the stomach easily. The underlying disease cannot be cured, but there are various ways in which the spasm at the end of the gullet can be reduced and symptoms improved. The valve at the lower end of your gullet may be temporarily relaxed by medication. Tablets such as nitrates or nifedipine will only produce a brief improvement in swallowing and are not effective in some patients, but may be useful while a more permanent treatment is planned. These tablets may cause headaches, but this usually improves with continued treatment. This is done under a sedative or general anaesthetic (where you are put to sleep). A small balloon (about 3-4cm in diameter) is used to stretch and disrupt the muscle fibres of the valve at the lower end of your gullet. This usually improves swallowing. The dilatation may need to be repeated after one or more years. Botox causes relaxation of the muscle fibres. It can be injected painlessly into the faulty valve through an endoscope. This is usually effective for a few months and occasionally for a few years, but then has to be repeated. Under general anaesthetic the gullet is accessed through the chest wall or the abdomen (tummy). The muscle fibres that fail to relax are cut, with a permanent improvement in swallowing. The operation is now often performed by keyhole surgery and only requires an overnight stay in hospital. If heartburn develops after treatment, consult your GP as medication may be needed to reduce the acid reflux. Sometimes your surgeon may suggest you take this routinely to prevent problems after surgery. Read about treatments for acid reflux. You should also see your GP if you still have swallowing difficulties or are continuing to lose weight. It's normal for chest pain to persist for a while after treatment - drinking cold water often gives relief.